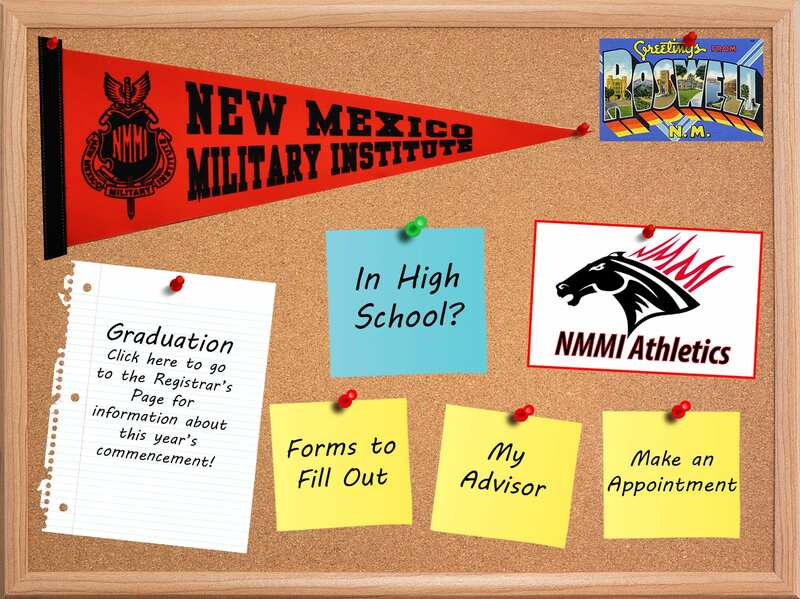 Mission Statement: New Mexico Military Institute Academic Advising connects cadets with quality resources that support academic success and empower cadets to create meaningful academic plans consistent with their personal and professional goals as they develop into leaders in the military and civilian sectors. NMMI delivers college academic advising using a blended model of primary-role advisors, who have offices in Toles Learning Resource Center, and faculty advisors, who work with cadets who have declared a concentration. It is recommended that all cadets meet with their advisor at least once each semester. A list of advisors can be accessed through the menu on the side. Very soon after starting school at New Mexico Military Institute, cadets should start thinking about what school they will attend post-NMMI. This will aid them in choosing classes that will prepare them for their future studies and are more likely to ensure timely attainment of their bachelor’s degree after transfer. To facilitate transfer to a 4-year institution, NMMI has articulation agreements with a number of 4-year colleges and universities. Cadets should talk with their advisor to determine if one of these schools and agreements will benefit them. Information about the Proposed NMMI General Education studies is available here.